When I was a kid – six or seven years old, I’d guess – my parents decided I was old enough to see a documentary about the Holocaust. With no idea what it was about, I was delighted to be allowed to stay up past my bedtime. 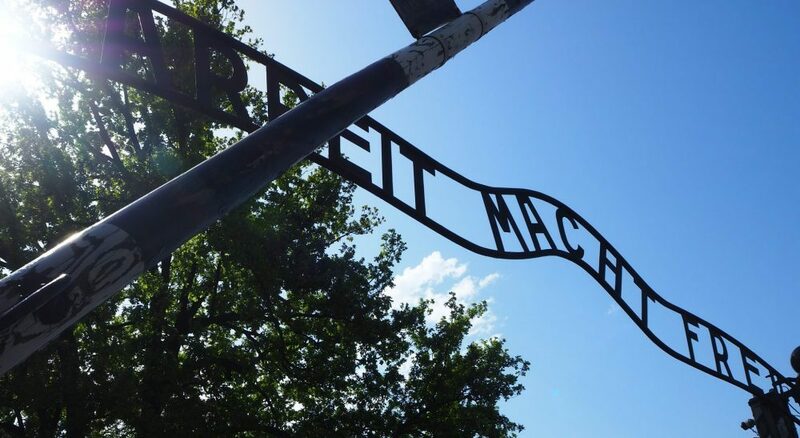 This cynical message, “Arbeit macht frei,” which means “Work sets you free” spans the entrance to Auschwitz. If my parents explained it at all, before or after, I don’t remember. I do remember how I felt, downstairs in the basement den, sitting on our old couch with my sisters: the same horror that anyone feels seeing these old films from before the Nazis built the gas chambers, when skeletal remains were thrown into huge ditches by people who were equally skeletal. The difference for me, I think, was that I had no idea how to digest the images. The horror sat in the pit of my stomach: a heavy green lump. It’s been there ever since. My parents were never particularly good at talking about feelings, and as far as I remember I was simply sent to bed after the documentary. I don’t remember them giving any explanation, either before or after, but they must have, since I had a vague idea that a bad man named Hitler had killed lots and lots of Jews. I didn’t even cry; I was old enough to think that crying is for babies, but too young to understand that everyone cries sometimes. I just went to bed without complaint, and fell asleep quickly, sleeping undisturbed. But the green lump stayed. Undigested. Unprocessed. I ignore the heavy green lump most of the time and get on with my life, but it’s always lurking, primed to pounce, and I’m startled how easily it surfaces whenever the subject of the Holocaust comes up. I can place the images in context now, which, of course, doesn’t make it any better. German soldiers made these films as a souvenir: something they were proud of. I understand now that those skeletal people, dumped as if they were garbage, were my people: Jews like me. People hated me that much. As a child, that was so outside my ordinary day-to-day life in suburban Connecticut that I just couldn’t connect it with this world I lived in. 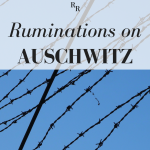 I tell this story because I recently went on a tour of Auschwitz concentration camp in Poland. 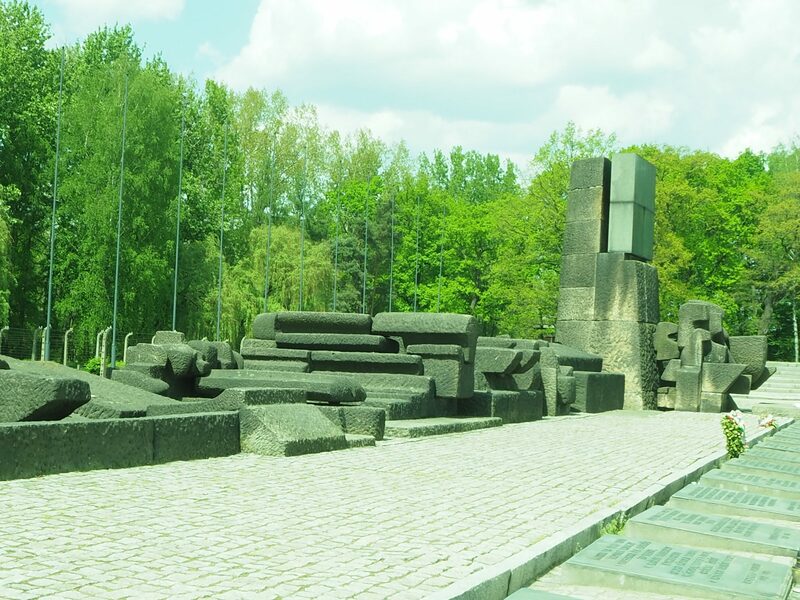 In this place, Nazis turned genocide into an industrial enterprise, efficiently processing, in just a few years, over a million souls into ashes. I believe it is important to bear witness. These crimes must not be forgotten, no matter how painful it is to think about them. This is why I visit Jewish museums, synagogues, and Holocaust memorials on my travels. I’ve also visited other scenes of historical cruelty, such as Badagry, Nigeria, where so many Africans were packed onto boats to be taken to lives of slavery, and Hiroshima, Japan, the site where an atomic bomb destroyed an entire city of civilians. As a Jew, though, and especially in recent years, with a noticeable rise in Antisemitism in Europe, I feel an urgency about bearing witness to the Holocaust. Guardhouses and rows of barbed wire edge Auschwitz I and Auschwitz II. But I didn’t want to tour Auschwitz. I felt like I already knew the story, and knew it too well. I and every Jew today carry it with us, even when, like me, we have not been touched directly by the Holocaust. So do Roma and Sinti people, homosexuals, the disabled, and any other group that the Nazis would have rated as undeserving of life. The fact that amongst the living hell, inmates still took the opportunity to celebrate birthdays, religious festivals and anniversaries. This happened in the latrines where the soldiers wouldn’t go. I think it’s important for us to go to understand the scale of the atrocities, to value our freedom and to ensure that such a thing never happens again. Also to understand how quickly life can change if we don’t act. So I signed up to take the tour, offered free to bloggers at a conference in Krakow. But it was largely out of a sense of obligation: to bear witness. In the days leading up to the Auschwitz tour, I dreaded it. I didn’t want to be confronted with all of that horror again. I feared I’d burst into tears in public; I fought back tears often in the days before my tour. The green lump in my stomach awoke and felt eager to emerge. At the same time, I was afraid of other tourists’ disrespect: the kind I saw at the Memorial to the Murdered Jews in Berlin. If I heard schoolkids laugh, what would I do? Make a scene? Would I be able to keep the lump down and stay calm? A small group of bloggers and Instagrammers, we were picked up by our Krakow Shuttle van early in the morning for the hour and a half ride. Resigned, passive, I went along. It felt necessary. I tried to shut my brain down, think about other things. On the way in the van, they showed a documentary about Auschwitz and its sister camp, Birkenau. Some of the bloggers slept; others watched. To avoid tears, I looked away often, letting my eyes wander between the screen and the peaceful country scenery passing by out the window. Brilliant green springtime fields, sleepy farmhouses. It was hard to believe that the scenes on the screen happened here. Arriving at the first part of the Auschwitz complex, called Auschwitz I, now used as the primary Auschwitz museum, our driver handed us over to a guide employed by the Auschwitz museum. We all wore headphones so that he could talk quietly into a microphone and still be heard. Giving a tour this way keeps everyone respectfully quiet: the guides don’t have to speak loudly and the visitors keep quiet in order to hear the guides. So equipped we move through Auschwitz in near silence. I flushed guiltily when I caught myself thinking it. But it was. The barracks are simple brick structures set in neat rows, and on my visit in early May, the trees among them stood bright with the green of springtime growth. Flowering bushes guarded some of the entrances. The only thing that gave away their true purpose was the tidy fencing of barbed wire. Spring blooms and attractive architecture are not aware of the horrors that happened here. Only the barbed wire betrays it in this picture. Auschwitz I was the first camp, built around 22 already-established army barracks in the Polish village of Oświęcim. 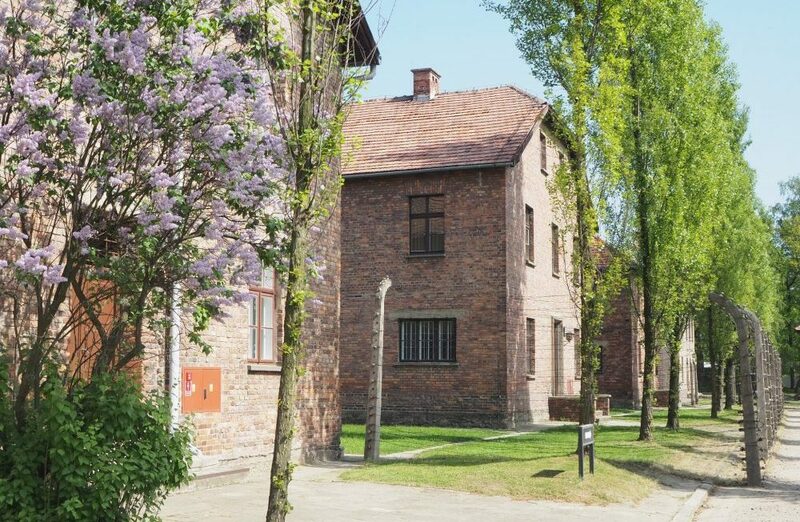 Starting in 1940, it was used as an internment camp for various Russian and Polish political prisoners and criminals. In 1942 it became a concentration camp, meant to work mainly Jews, along with homosexuals, political prisoners and Roma/Sinti, to their deaths, and, soon after, to serve in their efficient extermination in the gas chambers. Passing under the cynical “Arbeit Macht Frei” (Work sets you free) gateway that greeted the doomed deportees, our guide led us into several of the barracks buildings, one at a time. Some showed general information about what happened at Auschwitz, with photographs, explanatory signs, maps, examples of Nazi documents and a single urn of ashes meant to memorialize all the victims. We didn’t see all the exhibits on this tour. We missed, for example, one barrack devoted to the story of the Roma and Sinti who died there. Having crossed the threshold and begun, the heavy green lump lurking in my gut threatened to escape, but I kept trudging along among the hordes of tourists. The hardest exhibit to view, for me and probably for everyone who tours Auschwitz, is called “Material Proofs of Crimes.” It shows ordinary items of everyday life, found at the camp after its liberation. 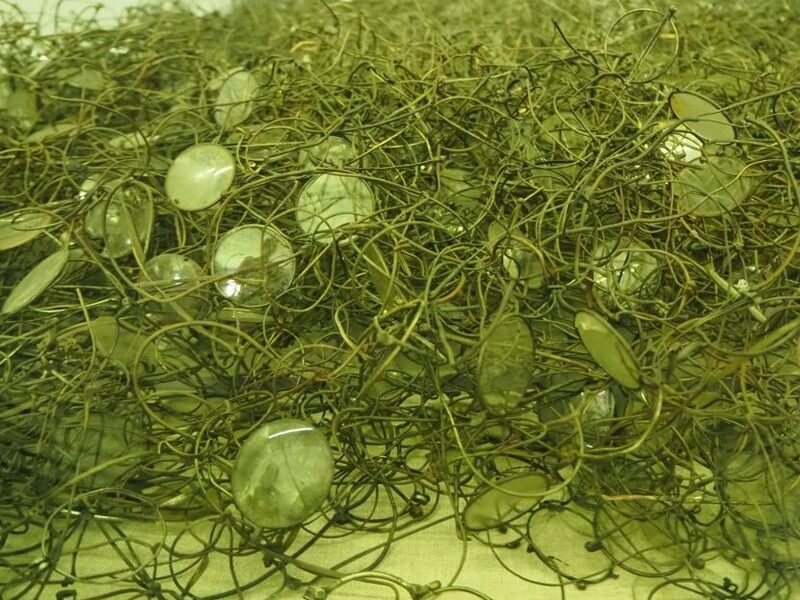 A massive pile of eyeglasses. 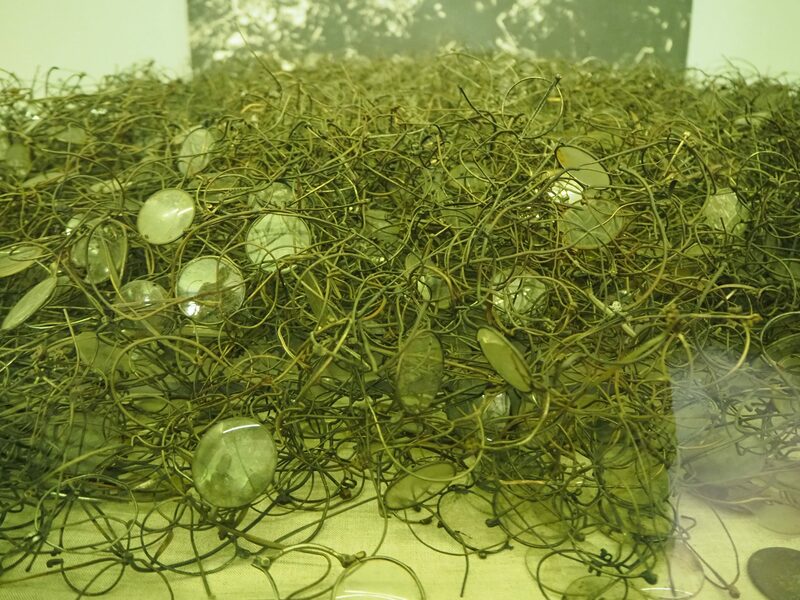 This photo shows only a small section of the pile of eyeglasses on display at Auschwitz, all taken from the victims. A much bigger pile of human hair, much of it neatly braided. I tried not to think of the ordinariness of that: We’re getting transferred to a camp until the war is over. I’ll braid my hair so it stays neat on the train. The hair was used to make cloth, and we saw a sample of that too. An equally large pile of shoes. Again, I fought to keep the green lump down. Some of these shoes were 1940s stylish: wedge heels, colorful straps. I pictured people trying on shoes in a shop, eying their feet in a mirror, making a choice. A long case of prosthetics: things like fake limbs and crutches and braces. 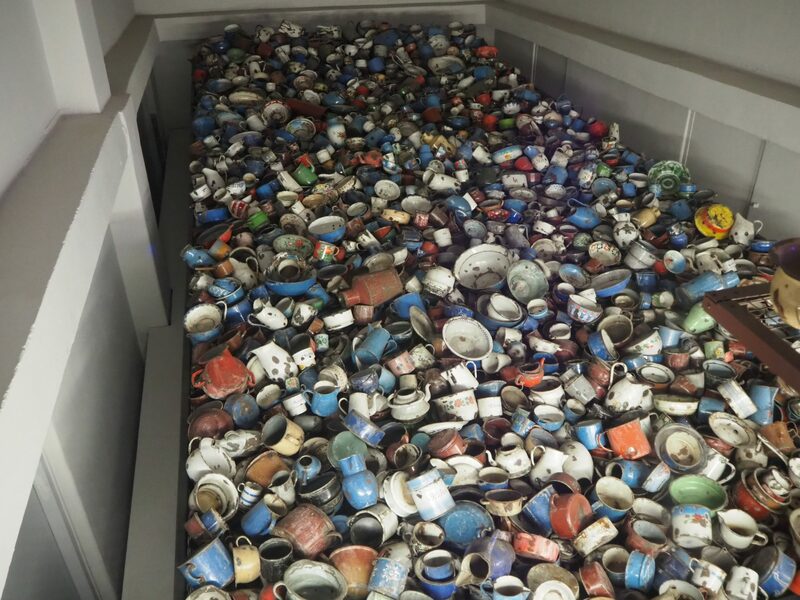 An entire roomful of discarded metal bowls and pots. These were used in the camp by those who weren’t killed immediately and who provided the slave labor that the Nazis needed for their extermination machine. Looking down into a whole room full of bowls and pots used by the prisoners. I would guess the room is about the size of a shipping container, maybe bigger. That heavy green lump finally escaped at the long display case filled with a haphazard pile of luggage. 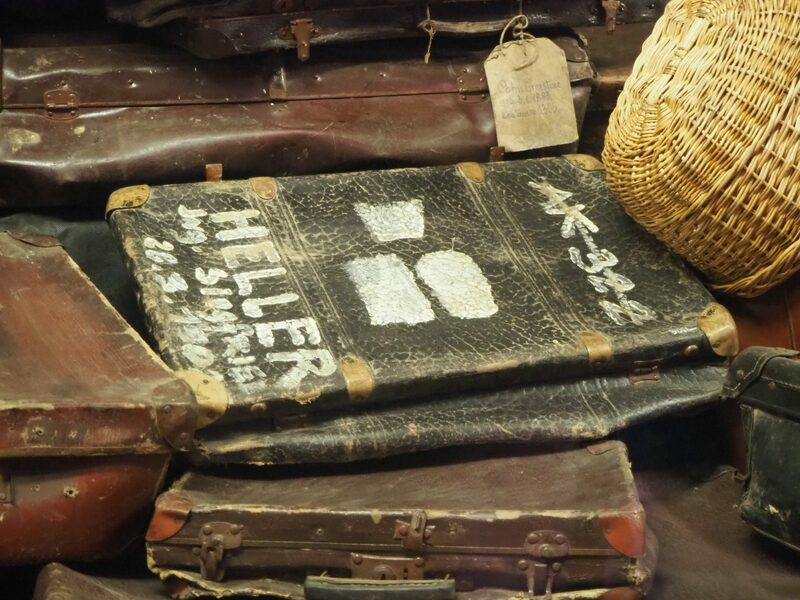 People packed their most precious possessions to take with them in these battered suitcases, and some had written their names and addresses in large letters on the sides. One of them proclaimed “HELLER”. Could this have been family? Just one suitcase in a very large pile of abandoned suitcases. I can make out the name Siegfried and HELLER and what I think is a birthdate: 28.3.1902. I don’t know what the short word before Siegfried is, and I don’t know what the crossed-out AK 322 means. In that dense crowd of people, I was the only one crying, as far as I was aware. Noticing the ugly sounds I was making, they turned, stared, and turned quickly away again. Sobbing, but at the same time trying to hold it in and not make a spectacle of myself, I pushed my way through the crowd toward the door. Rushing past the next few cases, I reached my group in the relatively less emotional section of the museum that showed the living quarters of the prisoners. Here I started taking pictures again, focusing on how to use my camera to pull myself together; figuring out the best way to set it, using it as a screen between the horrors I was witnessing and me. It kept the green lump at bay. Auschwitz I was where the Nazi scientists experimented with using Zyclon-B to kill inmates. The large-scale exterminations happened at Auschwitz II, but the Nazis destroyed those gas chambers and incinerators toward the end of the war. For that reason, the experimental one at Auschwitz I has been preserved. 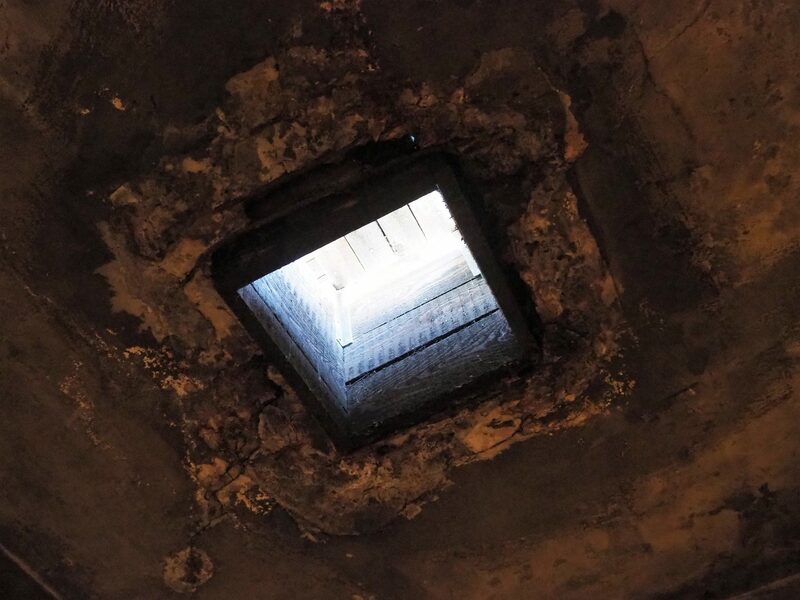 We walked through the room – not furnished with fake shower heads like the ones at Auschwitz II were – where the Zyclon-B pellets were dropped through a hatch in the roof. Here they perfected the procedure using political prisoners as their guinea pigs, figuring how much Zyclon-B it would take to kill everyone in the room within 20 minutes. The little hatch through which the Nazis dropped the Zyclon-B pellets. In the next room stood a few ovens for cremations. If they were going to exterminate so many people so fast, they would need to dispose of the bodies quickly as well. Apparently, the ashes were either spread on farm fields or dumped in the river nearby. The beautiful farmland we passed on the way here had been fed by the bodies of the victims. Auschwitz II, also known as Birkenau, is only three kilometers away. We were herded onto the Krakow Shuttle van to the entrance and met the same tour guide, Lukasz. This camp was much bigger than Auschwitz I. It was where most of the prisoners died. The famous pictures of the train pulling in and the Nazis separating out the Jews into two lines – the strong to work as slave labor, the weak to go straight to the gas chambers – happened here. 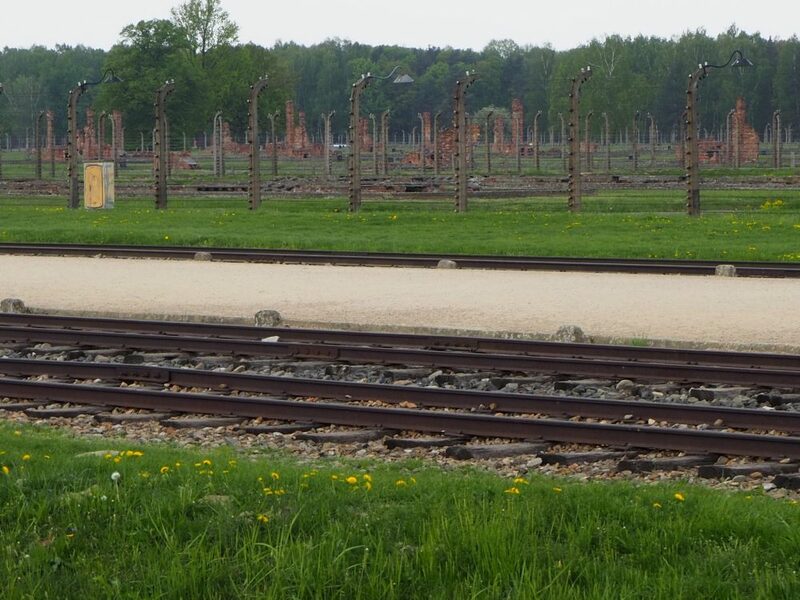 In the foreground, the track inside Birkenau where the deportees were brought in cattle cars and offloaded. Next to that, the platform where the Nazis separated them into two lines to live for a while longer or to die in the gas chamber immediately. In the background you can see the barbed-wire fences surrounding the remains of barracks, with the ruins of the chimneys partially still standing. What remains is the entrance gate, the train tracks, some intact barracks and many ruined barracks. The gas chambers and ovens are heaps of rubble. A large memorial stands nearby: an abstract concrete form in a brutalist style. The memorial at Auschwitz II Birkenau. In the right bottom corner you can see some of the plaques in different languages. We walked through an intact barrack where prisoners slept on shelves. The famous photos taken at the liberation that show the starved faces of people lying on the shelves were taken in similar barracks. Built to house 40 prisoners, it wasn’t unusual for a barrack to house 700. The slave laborers generally only survived for a couple of months, victims of starvation, cold, and/or disease. With inmates sleeping in these packed dormitories on too little nutrition, little heating, and too much work, diseases spread quickly. 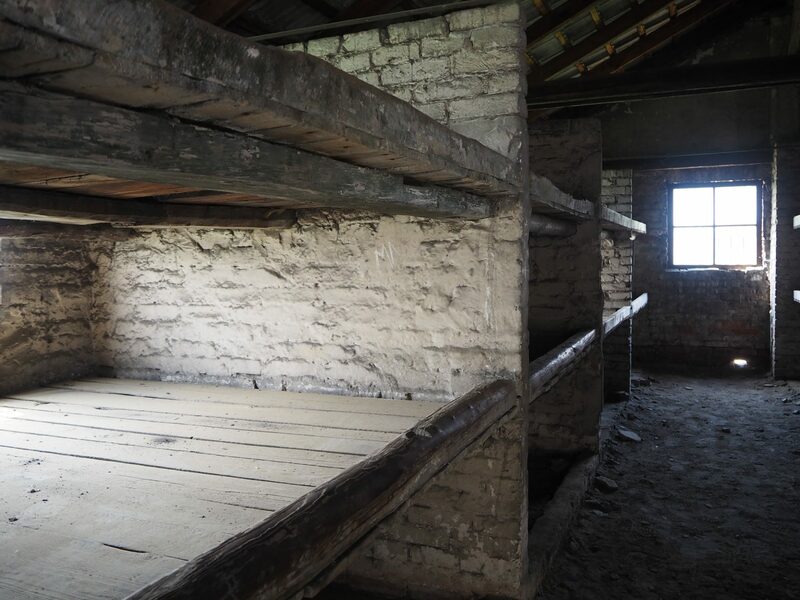 Barracks for the prisoners at Auschwitz-Birkenau, where they slept three high on shelves, several people per shelf. 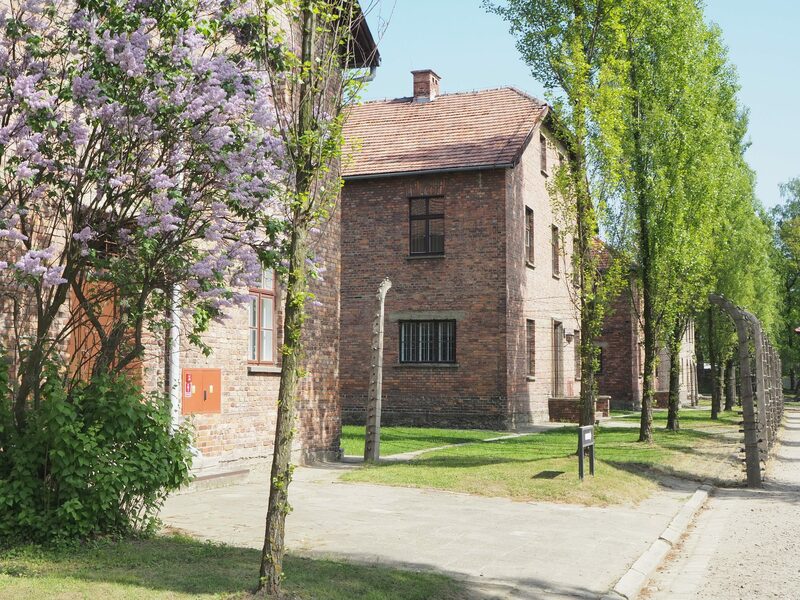 Auschwitz II, while less confrontational than Auschwitz I, with its piles of personal objects, emphasizes the enormity of the project through its sheer size: 140 hectares, about 1.4 square kilometers, with 300 barracks and buildings. 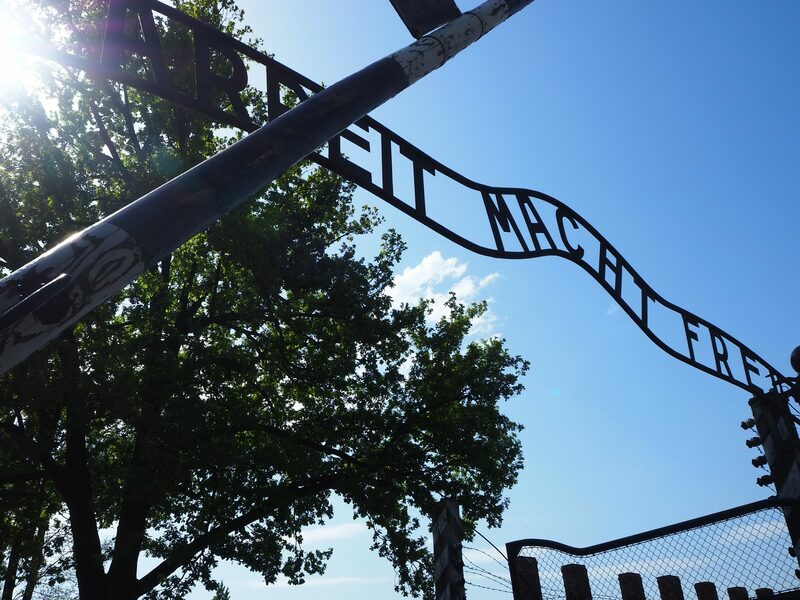 What if Holocaust deniers visit Auschwitz? I wanted to ask if he kicked them out of the museum, but we were interrupted. At one point as we were walking, two of the other bloggers were talking. I didn’t hear what they were saying, but one of them let out a small laugh. The guide immediately told them sternly to be quiet. I was pleased not only that visitors are told to show respect, but that someone was calling them on it when they didn’t. 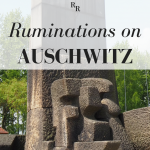 NOTE: To read more of my ruminations on Auschwitz, less emotional this time – a discussion of Auschwitz tourism and the current political disputes surrounding it, as well as information for visiting Auschwitz – click here for the second part of this post. 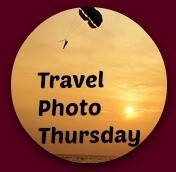 The images below are suitable for Pinterest. Thanks for being brave enough to share your personal feelings on such a sensitive topic. My family had fortunately already come to America prior to the extermination campaign. 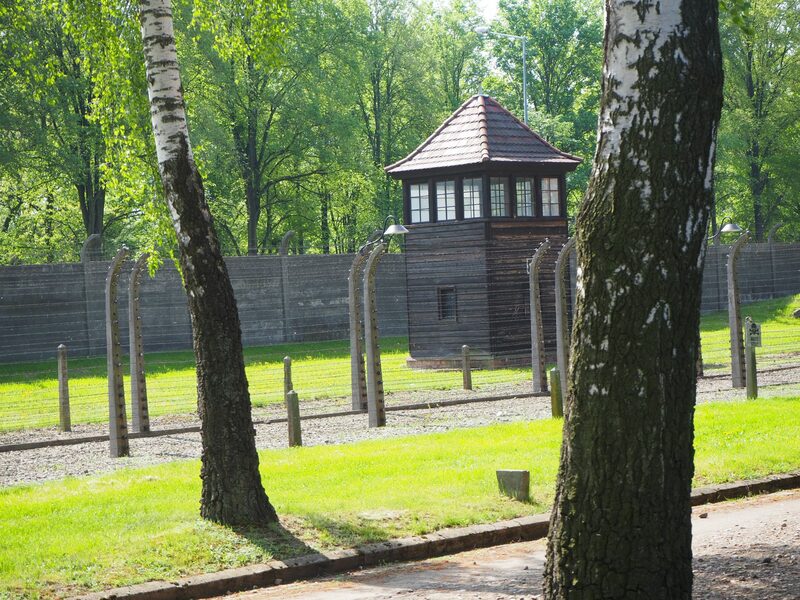 Visiting Auschwitz would be a difficult activity for most people, but you handled the subject quite professionally. Yes, my family went to the US after earlier pogroms at the turn of the century. But they lost touch with any remaining family, so I don’t know more than that. Thanks for reading! First a comment on bloggers who sleep through films and are able to laugh at whatever when at such a site . . .those folks are the ones who will forever keep the blogosphere from being taken seriously as a means of information and writing. As for your tour: I’ve visited the Holocaust Museum in Washington DC on nearly every trip I’ve made to that city. Not because I enjoy it, but because I believe everyone should visit that museum. And I too, even though I am not Jewish, have teared up and had to do some ‘ceiling staring’ along the way. . .mankind’s inhumanity to mankind is rather hard to take. A beautifully written post, Rachel. The sleeping didn’t bother me; it was early and we were all tired. And the laughing I didn’t even hear, since I’d moved away to take a picture. I just heard the guide’s response. But I get your point: there’s a lot of mindless gushing and ignorance of context in the blogosphere. I haven’t been back to Washington since that museum was built but I’ve heard it’s excellent. I’d recommend Yad Vashem if you’re ever in Israel. Thanks for visiting! I chose to read Part 1 because I want to feel what the writer is feeling. And you shared it with us so well. Auschwitz cannot be visited without evoking the kind of emotion that will make sure such a horrific crime will not be repeated. Growing up I always felt uneasy when it came to anything about the Holocaust. I never watched Shindler’s List. I never knew why until I was in my 40’s and discovered that my biological father was Jewish. 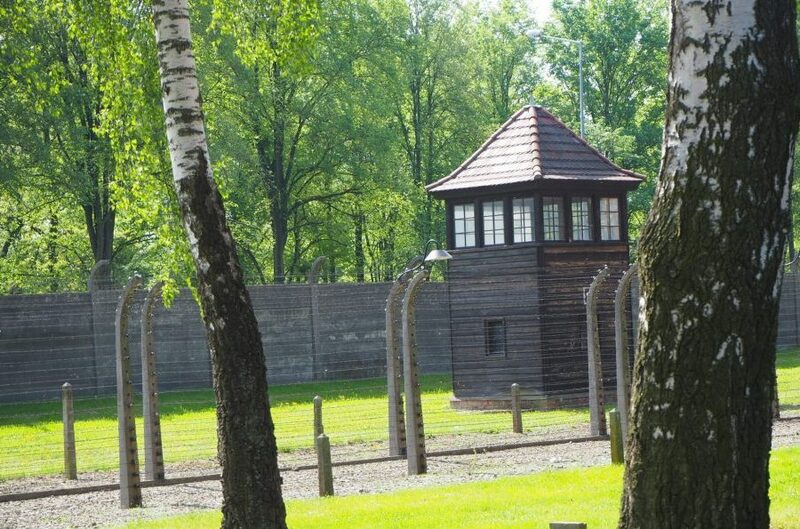 I don’t think I will ever visit the concentration camps, but I never say never. I visited the Killing Fields in Cambodia and that was horrific. Visiting a place where relatives could have been gassed would be extremely difficult. I can understand why it was so difficult for you to go there. 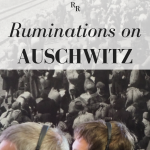 Through high school and college, I read everything I could about the Holocaust, but after I had my first child, I became incapable of forcing myself to do so. I had to send my sister to our sons’ Sunday school when a parent was required to attend the day they showed Schindler’s List. So, I don’t know if I’d have the courage to “visit” Auschwitz or Birkenau. I haven’t visited the Holocaust Museum in D.C. nor Yad Vashem in Israel. When we visited Budapest a few years ago, we toured a restored synagogue. Our volunteer guide told us he lived in Tel Aviv and New York. I asked him if he ever considered moving back to Hungary after the fall of the Iron Curtain. He said, he’d never move back. He told us that on this visit, the first taxi he got into had a sign “No Jews Allowed”. It’s not just Europe where the inhuman side of human beings surfaces. It’s all over the world. I despair. I know we have “better angels”, but the evil that still lurks in the heart of humankind is staggering. Yes, and it frightens me how easily those “better angels” can nevertheless be led to do evil, or at least to allow it to happen. You might want to read the second part of this post as well, since it addresses some of this, specific to Poland. You are so right. Everyone should bear witness to the horrors and atrocities so many have endured throughout history. My son, who is 33, still talks about meeting a Holocaust survivor at the Holocaust museum in Detroit when he was 5-years-old. Your parents did right by you and your sisters to introduce you to a reality so many would rather forget — or as you say, deny it ever happened. Thank you. Hearing a story from a Holocaust survivor (which I did too, as part of Sunday School, years later), is a valuable experience, even for a 5-year-old. But seeing those images at that age? I was too young. I think it would have been better to tell me about it at that age, but not let me see the photos till I was older. Hi Rachel. I can only imagine how painful that visit to Auschwitz was for you. I found the Holocaust gallery at the Canadian Museum for Human Rights in Winnipeg to be more than I could bear. Hi Rachel, impressive story! I think on the suitcase it might say: ing Siegfried Heller. Thanks, Peter. Yes, I think that’s what it says. But I haven’t been able to trace him.